Spark Science Kits is an international outreach initiative that sends kits filled with 16 hands-on science experiments to locations around the world to help children become better problem solvers. While the kits may seem like an unsuspecting combination of paper clips, rubber bands, string, and more common items, using the accompanying experiment guide you can quickly turn those simple materials into a scientific adventure! Our goal is to send kits to as many locations as possible as time goes on and eventually have kits in thousands of orphanages, children’s homes, and schools around the world. We hope that by spreading the joy of science to young developing minds we can inspire and create the next generation of scientists and engineers. In addition to the kits, we also want to help raise awareness of the importance of STEM in developing countries. 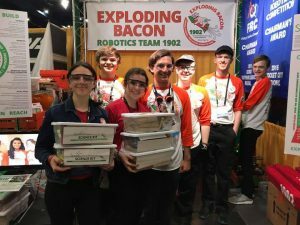 We know that we can’t do everything ourselves, so we also provide additional learning materials and lessons on our website, as well as instructions for other robotics teams and organizations to send Spark boxes of their own. We want to change the world together!